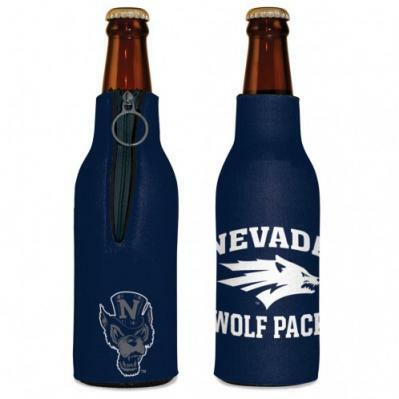 This 10" Nevada Shaped Basket includes a Nevada Proud Pint Glass, and a can of a Nevada Beer. This 10" Nevada shaped basket includes: a Davidson Tea package and a Nevada Trivia mug. This 10" Nevada shaped basket includes Kimmie Candy Tube Hot Chili Spiced Chocorocks, Hot Sauce, and a hot flavored Jerky. Because of the shape and fragile contents of the basket there is an additional shipping charge of $6.00 to accommodate the extra charge from shipping carriers. This 10" Nevada Shape Basket includes one box of Davidson's Tea, one 8oz. jar of Al Bees Honey, and one 4oz bag of Tahoe Toffee. This 14" Nevada Shape Basket Includes two different 12oz. bottles of Ruby Mountain Beer, Made at the basin floor of The Ruby Mountains, and a 6oz. jar of b-dubs relish or mustard and 3oz bag of Jerky Junction Jerky. This 10" Nevada shape basket includes 4 oz. Lattin Farms Gourmet Jam, one 8 oz. jar of Al Bees Honey, and a tube of Kimmie Candy.Because of the shape and fragile contents of the basket there is an additional shipping charge of $6.00 to accommodate the extra charge from shipping carriers. This 14" Nevada Shaped Basket has Wood Fire Roasted Coffee 1/2 lb. whole bean bag , Great Basin Brewery Pancake Mix and a bottle of their Great Basin Beer for you too make their yummy beer pancakes at home. Enjoy! This 12" Nevada shaped basket Includes 9 pack of Sugar Love Gourmet Chocolates, One 3oz. tube of Kimmie candy, and a 4oz. bag of Tahoe Toffee.Because of the shape and fragile contents of the basket there is an additional shipping charge of $8.50 to accommodate the extra charge from shipping carriers. This 14" Nevada Shaped Basket includes 2 bottles of Great Basin Beer, a Nevada Proud Pint Glass, Kimmie Candy Tube, and Jerky Junction Jerky. This 14" Nevada Shape Basket includes Blind Dog Coffee Nevada Black flavor, Tahoe toffee small Nevada shaped toffee and 2 Nevada trivia Mugs. For all the Coffee Lovers out there! !Because of the shape and fragile contents of the basket there is an additional shipping charge of $8.50 to accommodate the extra charge from shipping carriers. This 10" Nevada shaped basket includes Davidson's boxed teas, a gourmet chocolate bar and Davidson's Jelly. Because of the shape and fragile contents of the basket there is an additional shipping charge of $6.00 to accommodate the extra charge from shipping carriers. 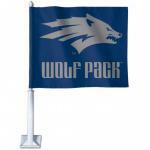 This 10" Nevada shape basket includes a Battleborn Rocks Glass, Battleborn decal and a stainless steel Nevada Flask. This 14" Nevada Shape Basket Includes 1 Nitro Rub (don't let name fool you, not Hot just good flavor) , 1 bottle of Battleborn BBQ Sauce, 1 bottle 18oz. BJ's BBQ Sauce, and 1 bottle Carson City 14oz. Original BBQ Sauce. This 14" Nevada Shaped Basket Includes "All DECAF PRODUCTS" , 2 Nevada Proud Coffee Mugs, 12 oz. Ground Blind Dog Coffee, and 2 boxes Davidson Tea. This 14" Nevada Shaped Basket includes 8 oz.Ground Alpen Sierra Coffee, 9oz. Bag of Tahoe Toffee, Kimmie Candy Tube, Sugar Love Chocolates Two Pack, Trivia Mug . This 12" Nevada Shape Basket Includes two 8 oz. Jars of Lattin Farms Jam, two 9oz. jars of Auntie D's Jelly, and one 8 oz. Al Bees Honey. This 16" Nevada Shaped basket includes: 12 oz Blind Dog coffee, 8 oz Alpen Sierra Coffee, and 2 Nevada Trivia Mugs. This 14" basket includes 2 stemless Nevada Wine Glasses, A bottle of Nevada Wine, and Davisons organic chocolate. The perfect gift for any Wine Lovers. This 16" Nevada Shaped Basket Includes 8 oz. Alpen Sierra Coffee, 16 oz. Jar of Killer Salsa, 8 oz jar of Al Bees Honey, 4 oz bag of Tahoe toffee, 9 oz jar of Lattin Farms Jam, and 2 Davidson tea boxes. Because of the shape and fragile contents of the basket there is an additional shipping charge of $12.50 to accommodate the extra charge from shipping carriers. This 16" Nevada Shaped basket includes Nevada Brining Company Carrots, pickles or Onions, Tillies Stuffed Olives, Battleborn Gourmet Jam, Al Bees 1 lb. honey, Jerky Junction Jerky flavors vary,Krunchy Capriccio date snack;and Garden Gourmet Dip Mix. This 16" Nevada Shaped Basket includes, Jerky Junction Jerky, Joneseys BBQ Sauce, Absurd Marinade, NV Proud Pint Glass, Great Basin bottle Beer, Kimmie Candy tubes, Garden Gourmet Dip Mix .Because of the shape and fragile contents of the basket there is an additional shipping charge of $12.50 to accommodate the extra charge from shipping carriers. 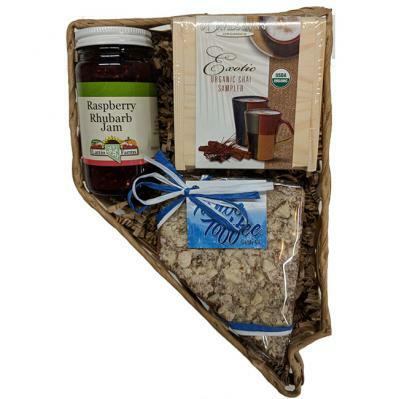 This 16" Nevada shaped gift basket includes 1/2 lb. Wood Fire Roasted Whole Bean Coffee, Nevada Brining Company Veggies or pickles, Davidson's wood tea box, Kimmie Candy tube, Tillies Dipping oil and balsamic flavor varies vinegar, Bag of Tahoe Toffee. Because of the shape and fragile contents of the basket there is an additional shipping charge of $12.50 to accommodate the extra charge from shipping carriers. This 16" Nevada shaped basket has either All-Natural, Organic, and or Gluten-Free items enclosed. Nevada Raw Honey, Davidsons Tea,Blind Dog coffee, Kimmie candy tubes, Davidsons Jelly ,Campies 1st aide Salve, Italian Hearts pasta sauce, Lip Balm,. Because of the shape and fragile contents of the basket there is an additional shipping charge of $12.50 to accommodate the extra charge from shipping carriers. This 16" Nevada Shaped Gift Basket includes half pound Wood Fire Roasted coffee, Kimmie Candy chocolate Silver Box, a bottle of a Nevada wine, 9 oz. Auntie D's Jam, Cappuccino mix, and 4.5 oz Tahoe Toffee NV shaped toffee. 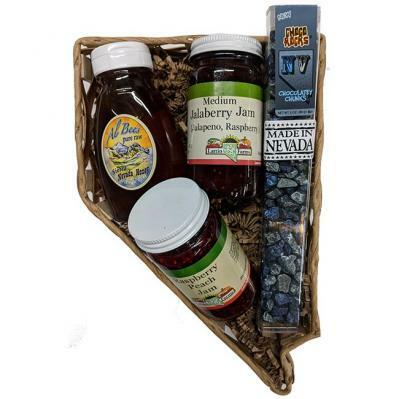 This 20" Nevada Shaped Basket includes, 1lb Alpen Sierra Coffee, Battle Born Marinade, Kimmie Candy Tube, Jerky Junction, Two Garden Gourmet Dips, Nevada Brining Vegetables, Kimmie Candy Siver Canister, Aunties D's 9oz Jam, Tillies Spears, Carson City Sin Sauce .Because of the shape and fragile contents of the basket there is an additional shipping charge of $16.00 to accommodate the extra charge from shipping carriers. One of our most popular gift baskets. This 20" basket includes two of our Nevada Proud coffee mugs that we designed, a great bottle of Churchill Vineyards wine, a package of Alpen Sierra Gourmet Coffee,Kimmie Candy Nevada themed Variety Tray, large Nevada shaped Tahoe Toffee and two boxes of Davidson's Tea. This 20" Nevada Shaped Basket includes, Killer Salsa, Grandma's Pancake Mix, Kimmie Candy Tube, BJ's BBQ Sauce, Churchill Vineyards Wine, Sugar Love Chocolates, Davidson Tea, Great Basin Beer, Grandma's Sourdough Mix, NV Brinng BBQ Rub, NV Shape Tahoe Toffee, Garden Gourment Dips .Because of the shape and fragile contents of the basket there is an additional shipping charge of $16.00 to accommodate the extra charge from shipping carriers. Want to make your own gift basket? 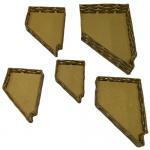 Our Nevada shape baskets are made out of quality wood products and hand crafted right here in the good old USA. Five Sizes to choose from 10", 12", 14", 16" or 20".